First, a shout out for my giveaway of 4 Le Creuset Mini Cocottes. If you have not entered, please check this out. Rum balls may be a popular Christmas confection but to me, they are one of my favourite childhood treats. They used to be the most coveted item in the my childhood neighbourhood bakery. 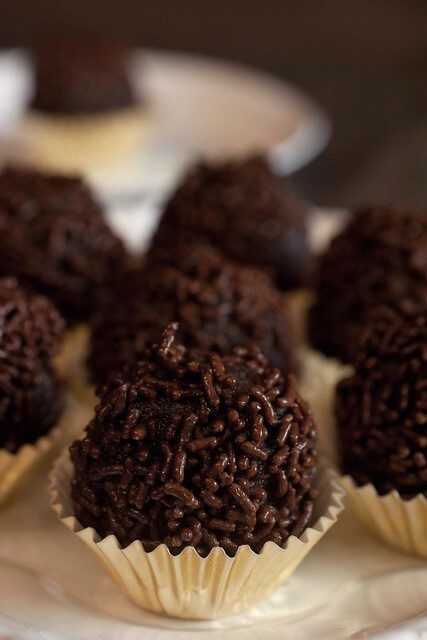 Dense and sweet, rich and chocolatey, they were possibly the closest to a real chocolate truffle I had ever tasted when I was a child. 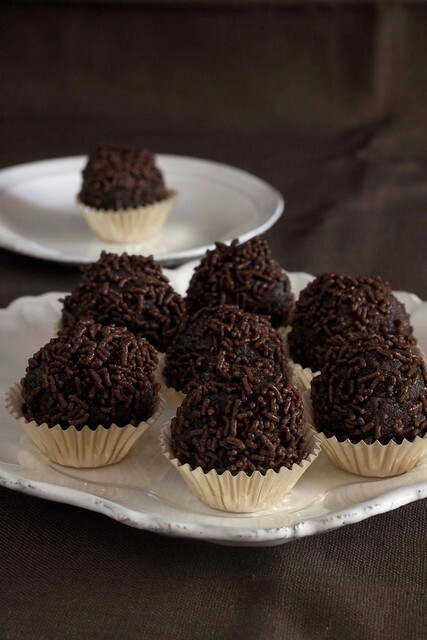 The traditional rum balls were made with crushed wafer biscuits and nuts but the version I grew up with in Singapore is more cake like and coated with the signature chocolate rice. As I searched through the internet for a recipe, this one, shared by Rima of Bisous A Toi appears to be the closest to what I used to eat as a child. A no-bake confection, this is totally achievable if you have some left over chocolate cake. I had some left over chocolate pound cake in my fridge and their buttery and rich texture is absolutely perfect for this. 1. Place chopped raisins and 1 tbsp dark rum in a small pot and heat gently to simmer. 2. Turn off heat and let raisins macerate for 5 mins. 3. In a mixing bowl, mix together cake crumbs, rest of rum, dessicated coconut, condensed milk and rasins. Mix well until the cake crumbs are combined together. 4. Use a small ice cream scoop, portion out the cake dough, shape and coat with Chocolate rice sprinkles. 5. To store, keep the rum balls in air tight box in the refrigerator. We used chocolate sweetened condensed milk. Have you tried it yet? Chocolated sweetened condensed milk? Have never seen that here.... :) Must be good! However, one time I tried to make it by myself at home. 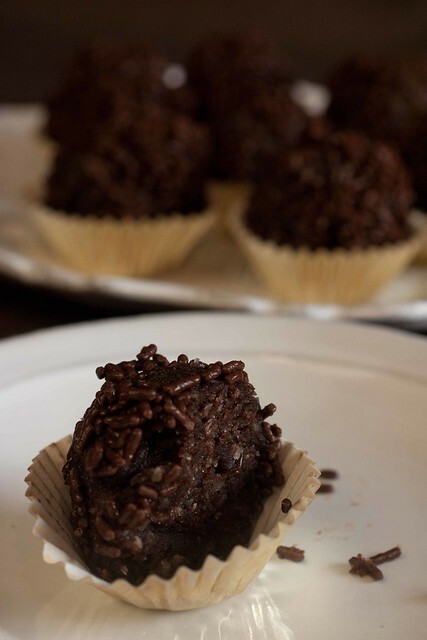 this is very common in Brazil, called "Brigadier" is made ​​with chocolate and condensed milk, but do not contain Rum. is mandatory at birthday parties. Wow three of my favorite things in one dish, coconut, rum and condensed milk! I would love these. Those look good :) I think I've never had or made rum/bourbon balls before! I always enjoy reading about your childhood food memories. Considering we both grew up in neighboring countries with similar cultures, I've never eaten a lot of things you did, this one included. As I'm typing this, a jar of dried berries and raisins are soaking in rum at home for a fruit cake - something about spiked sweet things and Christmas, can't avoid it yes? I've never had rum balls before :S They're not that popular here and though I've seen them before, I've always thought they were like truffles with rum in them? This sounds really interesting and tasty though! 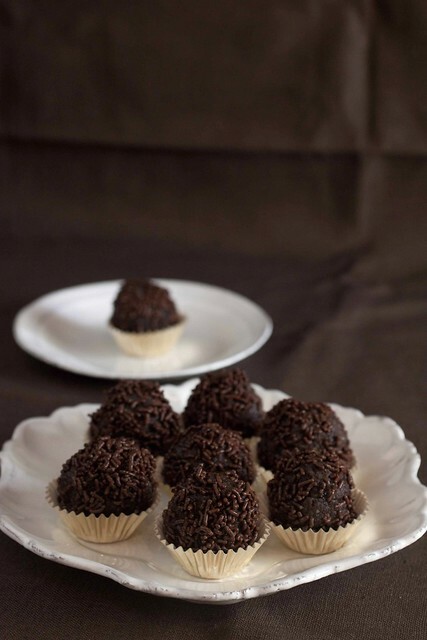 And they remind me of those fererro rocher balls (the ones with the dark brown wrapping)! Oh these are so delicious! I agreed you do not see these around anymore! That looks sooo good. A bite for each rum ball. I actually like your version with the condense milk and cake crumbs- and it can be even more festive by using christmas cake! I never had this before, but i know this is good, nobody can resist chocolate ! I like that you use leftover cake to make this. The raisin and rum in this is genius. that's true! i think it'll be macaroons for the younger generation ): i'm glad you decided to revive these! they look delicious! they look so adorable and chocolaty, what a great festive treat. I've never had these! But chocolate and condensed milk?! Yes please! that sure looks good.. i love chocolates. Wow! what a delicious recipe :) Love it! what dark rum do u use and where to buy it? Merry xmas to u and ur family! Mmmm.... These look just like some rum balls I had at Rosie's Cafe in Portland, OR in college. I've wanted to find a recipe that matched ever since! Once they're cooked, do you know the raisins are there, or do they just sort of blend into the rich cake? Pecan Cake & Best Wishes!